The flowers our Newmachar Florists work with have all been cultivated and then directly imported to us all the way from our suppliers in Holland, a region in the Netherlands renowned for the premium quality of flowers. This means that our flowers are the best and combined with up to four possible deliveries per week, not only are our flowers of the highest calibre but they are also the freshest. 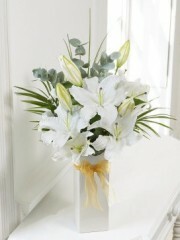 This means that they have a high longevity so your recipient will be able to enjoy their flowers for many days to come. Our suppliers provide us with an incredibly diverse range of flowers which all differ in shape, size and colour so our Newmachar Florists are able to work with flowers such as elegant calla lilies, traditional roses, exotic orchids an gladioli amongst many others. Our Newmachar Florists weave these flowers together with dense, lush greenery such as pittos and eucalyptus leaves in order to create a perfectly rounded bouquet body. Once the flowers have been arranged, our Newmachar Florists artistically finish off all of our bouquets with gorgeous papers, tissues and ribbons or alternatively they can have your flowers arranged into a gorgeous vase or box. Additionally, some of flowers - for example, the orchid - comes in a planted variety so if you're looking for something a little bit different from your standard flower arrangement, we also have plants on offer. Your bouquet can also be personalised by adding a pretty card with a message for your recipient or you are able to use the bespoke service. The bespoke service allows our customers to work in collaboration with our Newmachar Florists to create the perfect bouquet for your recipient as it will be fully tailored to their specific and unique tastes. Our Newmachar Florists are highly experienced in the floristry business with over forty years of expertise so we want our customers to know that they have and will continue to provide our customers with the best possible service. Once your order has been fully prepared by our passionate Newmachar Florists, we are able to have your orders delivered internationally through the Interflora delivery network. 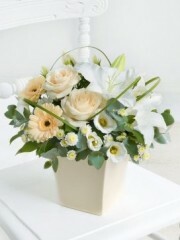 With Interflora we are able to deliver not only locally but nationwide to all the far corners of the UK as well as abroad to over 140 different countries worldwide so no matter where your recipient resides or if you are unable to be with your loved one during their special occasion, don't worry as we have your back covered. The delivery drivers - both local and international - always drive safely in order to prevent any damage being done to your order. They are efficient so you can be rest assured that your order will be delivered in pristine condition to your desired location. Unfortunately, we are unable to guarantee specific time deliveries when it comes to your orders however we do have our AM and PM deliveries which simply means we can deliver before 1:30PM and after 1:30PM. The reason as to why we can't guarantee times is we can't control elements such as traffic and we don't want to make any promises that we can't keep. With us, we want you to know that once your order has been placed, our Newmachar Florists will take care of everything on your behalf so you don't have to worry about a single thing.